Phase variations exhibited by extrasolar planets over their orbits encode valuable signatures of the global radiative properties and circulation of their atmospheres. The first step in understanding a planet's climate extremes is to understand the radiative forcing from its host star, which directly depends on its orbital motion and rotation. We approach atmospheric modeling from two distinct perspectives which both consider broad effects of planetary orbits and rotation. In the first we consider Earth-sized ocean-covered planets, on extreme orbits which lead to drastic and rapid periodic changes in stellar forcing, and examine how the combination of these extreme orbits and their rates of rotation affect the predicted phase variations. In the second we analyze near-infrared full-orbit phase observations from the Spitzer Space Telescope, with a model that considers only the minimum physics needed to capture the major features. 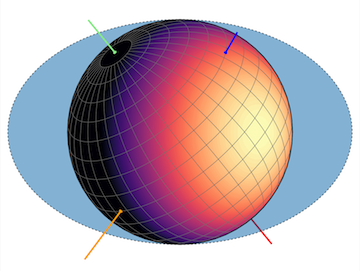 We demonstrate that not only a planet's rate of rotation, but also the orientation of its axis have major effects on the shape of the phase variations. Many extrasolar planets are thought to be significantly tilted, much like Uranus --- the stability of a severely tilted planet depends on the dynamics of the system and therefore offers intriguing predictions of not only properties of the observed planet, but of the system as a whole. Arthur Adams is a PhD student in the astronomy department at Yale University, working with Professor Greg Laughlin. He is primarily interested in characterizing exoplanets and their atmospheres, as well as astrobiology. His current projects explore the theoretical modeling of exoplanet atmospheres, using anything from simple radiative models to sophisticated global climate models. Before his time at Yale, Arthur studied physics and music at Brown University, and then went on to San Francisco State University for a master's in physics, where he worked with Professor Stephen Kane on research in exoplanet statistics.